I've been away a bit... feeling very tired it seems. Hopefully it is just the nasty weather...we had 4 inches of rain in about two hours Friday... and another few inches today. The MS-150 bike ride to Austin was cancelled for today, but is a "go" for Sunday... first time in 25 years.... 13,000 cyclists coming in from all over the US are stuck figuring out how to get to the new starting place Sunday. My niece's husband is riding in it... they're driving to Bastrop today to join the new starting point (LaGrange) early Sunday. (LaGrange had ELEVEN inches of rain Friday... terrible flooding and tore up the camp where 500 tents were set up for die hard cyclists who couldn't get hotel reservations). Anyhow... here's something I came across online. 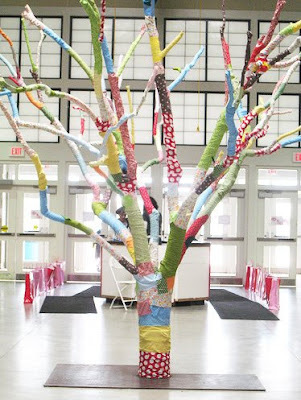 I love folk art, bottle trees, etc... but I'd never seen (or thought of) a fabric tree! This one is about 7 ft. tall. Wouldn't this be a nifty way to use up all those leftover pieces of fabric... or pieces of clothing? I may give it a go. These days I'm more into thinking up projects rather than carrying through with plans. Basically the cloth was torn or cut into long strips and wound around tree branches and fixed with glue. If used outdoors it obviously won't hold up a long time... perhaps a season or two (depending on how much fading & deterioration you can handle... for me... wd probably still be standing at least 5-6 years!). One of the homes in my old neighborhood had several crape myrtle trees along the side street. Each year the owner painted the bare trunks in several bright colors & I remember they seemed quite festive during the dismal days of winter. The paint didn't seem to harm the trees as they are still blooming (30 yrs later)... and still painted. Yea..we did get a lot of rain..much better today:) Hope you feel better soon..